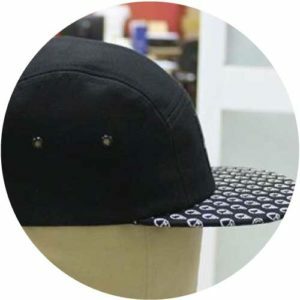 Today we present you the 5 panel camp cap from the brand “The French Cream“. 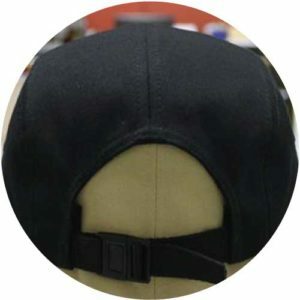 Entirely made of cotton, its closure is made of nylon with a black plastic buckle. 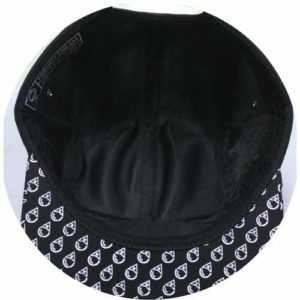 The originality of this cap is in the patterned print present only on the visor. Let’s focus on the appearance of this cap. It is mainly composed of black shade with touches of white. We can see a square woven label, representing the brand’s logo in the center. In addition, a serigraphy with an ice cream, the brand’s symbol, was placed on the visor but also below. Finally, to give a premium touch, the vents were made of metal. For the inside, another woven label is present at the level of the absorbent strip to make a last reminder of the brand. Who’s The French Cream ? 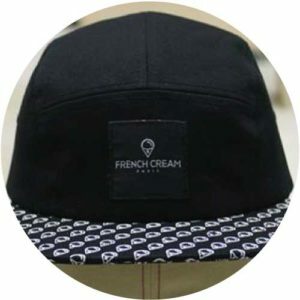 The French Cream is a French women’s and men’s ready-to-wear brand with a predominantly white and black t-shirt and cap line. Today, unfortunately, this brand no longer exists.